My youngest is starting Reception and I must admit I have not really given it a moment's thought...until I realised that I needed to make sure he is 'school ready' - whatever that means! I interpret this as him being able to dress himself for PE class and, dare I say it, go to the toilet on his own without needing me. This isn't my first time getting a child ready for Reception. One thing that I took for granted before was that my oldest could already hold a pencil and draw things that I could recognise by the time he started in Reception. NOT my youngest! I have therefore spent some time with him over the summer encouraging him to do so. I even found a little A4 whiteboard perfect for encouraging him to draw (I'm yet to recognise anything that he draws though...). I also gave him some of our activity books to play with. Removing stickers and colouring in has really helped develop his fine motor skills. We have two NEW books available this September. Both make excellent birthday gifts or would be great for your own kids to enjoy. My boys have enjoyed Neon World, you can't beat cool space stickers! 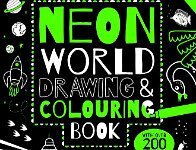 Make the world fizz with fluorescent colour! 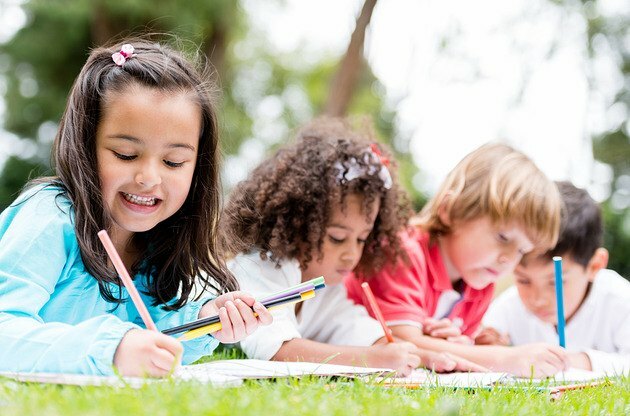 Young nature lovers will enjoy creating the most wonderful visions of our neon-tastic world by colouring and drawing their way through the age of the dinosaurs, visiting under the sea, flying high in the sky and then onwards to outer space. This book is totally à la mode! 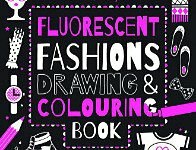 Encourage everyone's inner fashionista with this fun and flashy drawing and colouring book. From designer shop window displays to doggy coats and sumptuous scarves, the fashions inside are waiting for kids to style them. Suggesting highlighter pens will add a fluorescent flair. I'll keep you posted with how the first few weeks go and I wish good luck to his Reception teacher!